Now, I am not sure what types of download speeds I was getting before, but I am pretty sure they were no where close to 15Mbit/sec. My best guess is that last time I tested my connection speed it was in the 4Mbit/sec range. Not sure if this is part of something that was announced, if it is Comcast’s Holiday gift to us, or if it just a temporary glitch in the matrix, but I guess I should enjoy it while I can. And yes, the upload speeds are still slow….maybe those will get bumped next. 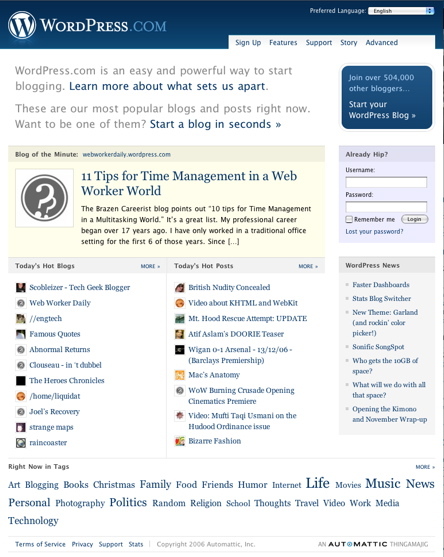 WordPress.com has a new look this evening! Big ups to Matt Thomas who did an awesome job on the design.